Annie: I pretended to be someone else tonight. [...] I did it because I don't want to be me. I did it because... I'm not sure who I am. It's a terrifying thing to have an identity crisis. I think it's interesting that this is one of the things they never tell you when you're in college. College is spent preparing you for the "real world" -- the working world where you put in eight hours a day and then go home and spend your weekends binge-watching Netflix on the couch. And in between the term papers and the assignments and the lectures, you would think that people would tell you about what it feels like to graduate from college and to learn to identify yourself as something other than a student. The fact is that most of us spend so much of our lives in school that when we get out of it... we feel a bit lost. We can no longer identify ourselves by the university we went to or the major we chose or the clubs we were a part of. We have to find our identities in something else and the something else is the scariest part because a lot of us don't know who we are when we strip away those labels. This season of Arrow is all about identity. Its focus is on the central question: "Who ARE you?" Who is Oliver Queen, really? Is he The Arrow? Is he -- or can he be -- a normal member of society or will he always battle his alter ego? In "The Magician," we see Oliver contemplate this idea of identity further, as we return to the central themes of the first and second seasons. In this episode, Nyssa returns to Starling City and she's intent on seeking revenge on Malcolm Merlyn. More than that, though, she's intent on Oliver enacting that revenge by killing Malcolm. And so Oliver spends the episode torn between his vow to not kill anymore and his desire to bring justice to his city and between his vow to protect and his vow to honor the memories of those he's lost. So let's talk about promises and vows then, shall we? What's interesting to me about "The Magician" is that Felicity Smoak is absent for almost all of it and yet she's still there, in every crevice, because she's become a part of Oliver's life that's so inseparable from him. She is his light, after all, and his hope: she's the person who encourages him when everyone else has given up and walked away; she's the one who will tell him exactly what she knows to be true even if he can't bring himself to believe it. I've said it in my character appreciation post and I said it in my review of The Flash, but Felicity believes in people and when she believes in them, she doesn't STOP believing in them. Does she occasionally walk away and place distance between herself and Oliver? Yes. Of course. But that doesn't mean that Felicity stops believing in his capabilities. It doesn't mean she stops seeing the best parts of him -- the parts he doesn't think are there anymore. People like Oliver need people like Felicity. People who are jaded and broken and self-sabotaging need people who are hopeful and caring and truth-telling, even when that truth is difficult to hear. When Tommy died, Oliver made a vow to not kill anyone anymore. Tommy died believing Oliver to be a killer and I think that hurt him more than any physical wound ever could. That his best friend died believing Oliver to be the darkest kind of person was utterly horrifying to him and scarring, so much so that he placed the largest possible distance he could between himself and the people who still needed him. It was Dig and Felicity who brought him back from the island and during the second season, it was them who encouraged Oliver toward the path of becoming a hero. And though Oliver did kill in the second season ("State v. Queen"), he killed to protect the person he cared most about; he killed because "there was no choice to make." You see, for Oliver, there are a lot of choices. There's the choice to become a killer or a hero. There's the choice to push people away or let them in. Oliver always has a choice, but when he killed The Count to save Felicity, he noted that there was no choice to make -- he was always going to save her. He always will. But that isolated incident is really the only time we've seen a choice come easy to Oliver Queen. Most of the time, Oliver struggles with his decisions and his life, especially when there is a lot of emotional investment at stake. Oliver really cared about Sara and I have no doubt at all that he wants to bring justice, but he has a choice to make. He can let Malcolm live and track his movements or he can take him down with an arrow. In the first season, Oliver would have done the latter. He would have had very few qualms taking Malcolm's life. Being a vigilante meant wiping names off a list; being a hero, to Oliver, means giving everyone a chance to make a choice. And when Malcolm tells Oliver that he followed Thea back to Starling City and had nothing to do with Sara's death -- when he swears on Thea's life that he did not -- Oliver lets him go. "The Magician" provides a Hong Kong flashback that ties in pretty well to the story, as we watch Oliver in the past attempt to live with himself after killing a man in the city for a mission. Maseo and Oliver have a conversation in the former's home about these missions. Maseo then tells Oliver that they need to learn to just live with the burden of their missions, to which Oliver then replies: "I didn't realize having a conscience was a burden." That is the most profound and integral line that is spoken in this episode. In the flashback, Oliver says this line rather bitterly and cynically, but you can almost hear it echo all the way to the present in Starling City. A conscience is a weapon and it's a tool and it's something extremely powerful and dangerous. Oliver Queen as The Arrow has a conscience. He knows when someone is lying and he knows that he cannot live with himself if he takes an innocent life. Let me pause, for a moment, to reflect on the themes of innocence and guilt that also pepper the episode. Nyssa and Laurel demand Malcolm Merlyn's execution when they presume he killed Sara. But even when Oliver lets Malcolm go after their conversation, Dig, Nyssa, and Laurel all demand that Malcolm be killed as well. Their rationale is pretty solid, if you think about it: Malcolm may be innocent in this circumstance, but he isn't innocent. At all. He is a murderer and a liar and he deserves to be punished for those crimes, even if he did not kill Sara. So Oliver has a decision to make -- he needs to decide whether or not he is willing to take a man's life whose hands are covered in others' blood and in other crimes apart from Sara's murder. And Oliver's decision... is to spare Malcolm's life. You see, I think that Oliver realizes in some ways, being a vigilante was easy. He had no reliance on a conscience back then, really: if someone did something wrong, they deserved punishment. It was as simple as that. But his own words from Hong Kong come back to him in this episode because having a conscience IS a burden; living with a conscience means that you have to make the decision to act against your human nature. Oliver could have killed Malcolm and he would have been justified in doing so, but he wouldn't have been RIGHT in doing so by his standards and he knows that. His vow to honor Tommy's memory and to honor his mother's memory wasn't just a no-kill vow. That's too simple. Oliver's vow was layered and more complex than that. It was a vow to become the person who other people believed he could be. And I do think -- honestly and truly -- that Felicity had a lot to do with Oliver's decision to not take Malcolm's life. It's not as evident because Felicity was absent the entire episode, but think about it: who constantly tells Oliver to keep his vows? Who constantly reminds Oliver of the person he is? Who constantly tells Oliver that there is always another way -- a way apart from the one he can only seem to see? Who tell him to keep fighting and keep moving and keep living? Oliver has changed because he's allowed himself to be affected by this blonde hopeful light. He's trying to keep his vows not just because he wants to lower the number of bodies he drops in Starling City but because he wants to find another way to identify himself. And Oliver choosing to spare Malcolm's life because he knows -- in his own extremely warped way -- that Malcolm loves and will die protecting Thea is Oliver growing not just as a person but as a hero. "The Magician" shows Oliver struggling for a bit over who he really is as a person and as a masked hero. What I've settled on, after the episode, is this: Oliver is a person who will enact justice, but who is also merciful. He is not vengeful. He is fiercely protective. And he is trying to be honest -- honest with himself and honest with other people in his life. Unfortunately for Oliver, he realizes that honesty comes at a price and that price is that sometimes people mistake your vows and your virtues for weaknesses and character flaws. Laurel is angry and I understand that anger, but it doesn't make it easy to watch and it definitely doesn't make it easy to accept because the thing about anger is that angry people aren't fun to be around. And angry people cut others down at every turn because they cannot control their emotions and their rage. Nyssa understands this better than anyone when she shows up in Starling City and finds herself being the emotional punching bag of Laurel, who blames her for dragging Sara down into darkness and into the League. Laurel is angry and she's lashing out at anyone and anything because if she can just somehow make sense of her sister's death -- if she can find someone, ANYONE to blame for it -- then she can make sense of her world and her feelings. Nyssa, in turn, is patient and understands Laurel's anger better than anyone else, absorbing it and then firing it right back at Laurel. (Sidenote: Thank you, Nyssa, for giving Laurel a much-needed reality check this episode. Someone had to and clearly Oliver just doesn't really have the time to do so.) Now, don't misunderstand me: anger is not wrong. Grief is not wrong. But the ways that Nyssa and Laurel express it throughout the episode are. Laurel's anger causes her to make Nyssa promise that she would avenge Sara's death at all costs. Both women are in pain and mourning and both see Oliver's vow as a weakness in this episode. Nyssa somehow sees his vow to not kill as less important than her vow to protect Sara and love her. Laurel sees Oliver's actions as cowardice (where, not to stir the pot, Felicity would have seen them as bravery) for a vast majority of the episode because she is the kind of woman who views the world in black and white. She was an attorney, after all, and when she looks at people, she tends to see either guilt or innocence. And that is not inherently wrong, per se, but it is difficult to watch her berate Oliver when she cannot understand all he has been through in arrive at his vow in the first place. The episode ends with understanding between Laurel and Nyssa, which was good, as earlier in the episode, Nyssa told Laurel that she was unworthy to wear Sara's leather jacket (ouch). Grief can drive wedges between people, but it can also build bridges. In a weird way, I think that Nyssa coming to town was what Laurel needed. She needed to express her anger and frustration and bitterness at someone who understood exactly what it was like to feel hatred and want vengeance. Deborah pointed this out on Twitter, but I am intrigued with Laurel's arc because right now, she seems to be on more of a super-villain trajectory rather than a heroic one. So I'm interested to see what Sara's death will continue to do to Laurel as the hunt for the killer escalates. 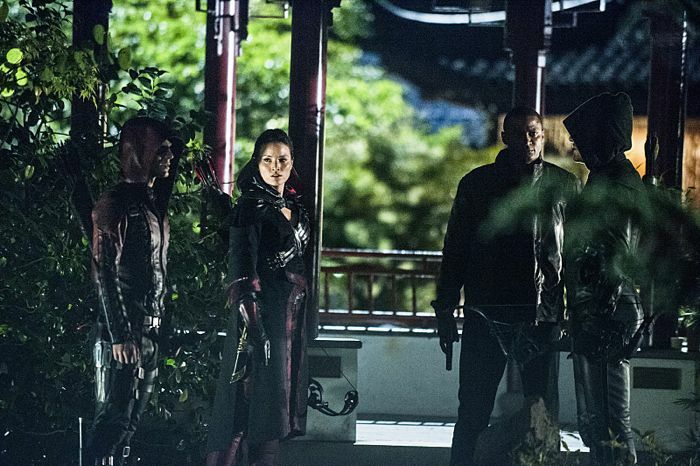 Additionally, the episode's end proved to us that a rift formed between Nyssa and Oliver -- Nyssa returned to her father and they both noted that if Oliver Queen does not stand with the League and its methods, then he stands against them. Grief does not change us, after all. It reveals us. And it revealed a lot about Laurel and Nyssa in "The Magician." I don't have a whole lot to say about Malcolm Merlyn throughout this episode, as he was heavily featured but also not heavily featured, if that makes sense? While Oliver is trying to be more open and honest with Thea as he promised back in Corto Maltese, the latter is being more secretive than ever, lying to her brother about where she was the night that Slade's army attacked the city. She keeps lying to him, which I just find to be ironic: as Oliver is opening up more and more of himself to his baby sister, she's pushing further and further away from him with her secrets. I really do love the complexity of the Malcolm/Thea relationship because although it is warped and although it's clear they both have a lot of issues, trust is not one of them. Thea implicitly trusts Malcolm because he told her the truth when no one else would; he protected her when everyone else pushed her aside. And that is so important to Thea as a person when she's searching to find her identity. Who is Thea, anyway? In "Unthinkable," she denounced her surname, essentially, so season three of Arrow is essentially a journey for Thea in self-discovery. As we saw in "Corto Maltese," Thea learned a lot from Malcolm and from his teachings, in spite of their pain. She's learned that she is stronger than she gives herself credit for. She learned that she deserves a fresh start. She learned that she will always be protected, even when -- or especially when -- she doesn't want that protection. The bond that she forged with Malcolm is strong. It's tinged with darkness and bitterness and pain, but both Malcom and Thea, respectively, fill a void in each others' lives that was missing. Thea gives Malcolm a fresh start of sorts -- a chance to prove that he can and will protect those he cares about. Malcolm provides Thea with a teacher, a father, and a protector. I feel like I keep saying that I'm really excited to see Thea Queen develop this season, but I am really excited for her arc now that she's settled into Starling City. I want her to fight for her independence, fight for what she believes, and fight to be respected. Because everyone in Arrow is fighting for something these days. People are fighting for love and justice and vengeance, for families and to protect secrets and to keep vows. But what is more telling than these characters encountering obstacles is how they handle those obstacles. What you do when you are in the heart of a fight says more about who you really are than anything else ever could. MVP for this episode is bestowed upon the exceptional John Barrowman. I'm always blown away by his work, but I love the complexity and darkness he brings to Malcolm Merlyn. You can tell that Malcolm genuinely loves Thea in the most twisted way possible and will always strive to protect her. The scene between Malcolm, Nyssa, and Oliver at the warehouse was fabulous and the confrontation between Malcolm and Oliver in the city was fantastically acted by Barrowman. Very close runner-up for MVP is Katrina Law. I really and truly loved her return as Nyssa al Ghul. That opening scene in the foundry nearly drove me to tears and everything from there on out was fabulously acted. Since The Flash was Felicity-centric this week, Arrow was Felicity-lite. I missed her but I think this was a good week for her to be absent. "I didn't show Sara the darkness, Laurel. It was already inside of her." "You guys are professional killers. That's a pretty low bar." Okay, Roy's quips the last few episodes have been so hilariously on point. "I almost didn't recognize you without your Halloween costume." "She told me an idiot can run it." "I will try very hard not to take that personally." "What are you calling yourself these days? The Arrow?" The disdain in that line was so funny to me, you don't even know. "You don't have anything. You're a bum." The fight scene between Oliver, Nyssa, and Malcolm was so great to watch. This show has stunning stunts (ha, ha). "... What did I miss?" "Are you okay?" "It's not my first time being kidnapped." "He's trying to keep his vows not just because he wants to lower the number of bodies he drops in Starling City but because he wants to find another way to identify himself." Hmm yes, this. If Oliver kills someone, even Malcolm--especially Malcolm since he thought he did it before--then he's going backwards, he's going back to being he vigilante, the Hood. And he doesn't want that. He wants to move forward and some something else. And here he's realized that the people around him (Felicity's absence noted) don't see him as the person he's trying to be yet. They get it, I think Dig gets it, but he's still willing to let Oliver suffer the consequences of that decision. I love Dig, but he didn't offer to kill Merlyn or get ARGUS involved. It's Oliver's decision and that blood would be on Oliver's hands. This was an important episode for Felicity to "miss" and I think it was very purposeful that her trip to Central was during this moment, because it would have been so easy for her to step in and say no, no killing and it wouldn't have been a choice for Oliver, he would have listened. But then the decision is based on Felicity and not himself. This time he made the decision for himself--due to Felicity's past influence of course, but made in the heat of the moment on his own. Definitely important for the development of his identity. So much of his choices in life have been the influence of other people--his mother, those he met on the island, Waller, etc. And when he came home, he made a decision on his own of who to be, but now he doesn't want to be that person, so he's got to be something else--but it can't come from other people. He's done with that. It's got to be himself. And he made that no kill decision himself here. "It's difficult to watch Laurel -- a woman who has known Oliver longer than anyone on the team -- demand that he kill Malcolm Merlyn and berate him, spit insults at him, because he made a vow to not take a life. " It's also difficult because she spent so much of season 2 pissed at the Arrow for being a killer, for not saving Tommy. She's reversed all of that anger into WANTING him to kill. As for Thea, she's keeping her own secrets from Oliver and Roy but has yet to come to understand that this is exactly why she was mad at them to begin with. There is so much tension to be had because she still doesn't know Oliver is the Arrow (and while she said she was mad about the lies about HER that they kept, it's still a big thing to not tell her) and who knows how she will react when she finds out. I think there must be some incident to come where, in addition to her secret about hanging with Papa Merlyn, she will have to keep something about Oliver to herself, aka the same type of lie she was so mad at. And she will have to learn to understand and accept the burden of those lies, putting her in the same boat as Oliver and Moira all those years. Because the Queens can't help but keep secrets, and the Merlyns seem to be even worse. Oh I am SO glad there's a new Arrow this week! I thought it'd be off since the Flash isn't back for two weeks, but I guess that means that somewhere before 8, there will be a week off for Arrow? Or two Flashes in a week, in order for the 8s to match up in the same week. But I'm glad we get Felicity next week, I'M SO EXCITED! I really really love what you said about Oliver and the importance of Felicity's absence. Felicity definitely would have told him to find another way, to not kill Malcolm, and we knew that -- HE knew that -- but he also knew that since she wasn't there, she couldn't tell him what to do. It had to be his decision and he had to live with the consequences, good or bad, of it. And I totally understand why Oliver saved Malcolm. And I totally understand why everyone else didn't want him to. So it's important that this decision was made by him and him alone. It shows that Oliver needs to take that step by himself in order to determine what kind of person and hero he really is. UGH, Laurel really rubbed me the wrong way this episode and I'm usually at least playing devil's advocate when it comes to her. Her abrupt 360 at the end was what downright baffled me. I understand that she's angry, but the anger is coming off as calloused and abrasive, which is probably why I -- and a lot of others -- are keeping her at arm's length for the time being. I'm so excited for the Felicity Smoak-centered episode next week. I presume there will probably be a week off to come for Arrow (though we already had a week's break, didn't we? Or am I making that up?) so that the episode coincide. After seeing EBR on The Flash, I'm even MORE stoked for the crossover to happen and I didn't think that was possible. As always, Connie, thank you for your comments! Oliver knows -- clearly from Thea being abducted right outside Verdant -- that he cannot protect the people he loves the way he wants to. That's partially why he's pushing Felicity away from the foundry, into another life (and why Felicity told him she's not going to wait around while he hides in the foundry forever). After the bomb in that restaurant, he realized that he can always try to protect Felicity, he can always try to protect Thea, but he will probably fail. And if he fails, he could lose them both. So he puts them both -- arguably the two most important people left in his life -- under an additional form of protection. He pushes Felicity away so she will be distanced from The Arrow and therefore less likely to fall into harm. He protects Thea by letting Malcolm not just live but by trying to protect HIM. In this warped sort of way, Oliver knows how much Malcolm loves Thea and will do anything to keep a hedge of protection around her. If Oliver brings Malcolm to justice, then, what would that do to Thea? It would expose her, right? Oliver knows how ruthless Malcolm is and now ruthlessly he will protect his own daughter. So while Oliver's decision is -- perhaps -- not the best decision for the "greater good" as a hero, it is the best decision for him as OLIVER and, specifically, as Thea's brother. That's where this whole dichotomy of Oliver/The Arrow comes in with his choice to be a hero or his choice to be Oliver. And it is interesting, right, because the choices Oliver makes as The Arrow affect him as Oliver Queen and vice versa. That's the whole point of this season, really: this concept of identity and whether or not Oliver can ever separate the choices he makes as a person from the choices he makes as a hero. Also, I realized you signed your name at the end. So thank you, John!